For fifty years, Trekkers all over the world have followed the voyages of the Enterprise and her crew. 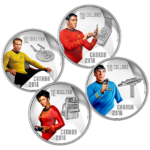 In celebration of Star Trek‘s 50th anniversary, the Royal Canadian Mint has released a number of commemorative coins. 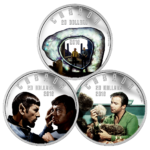 A $10 coloured silver coin picturing the commander of U.S.S. 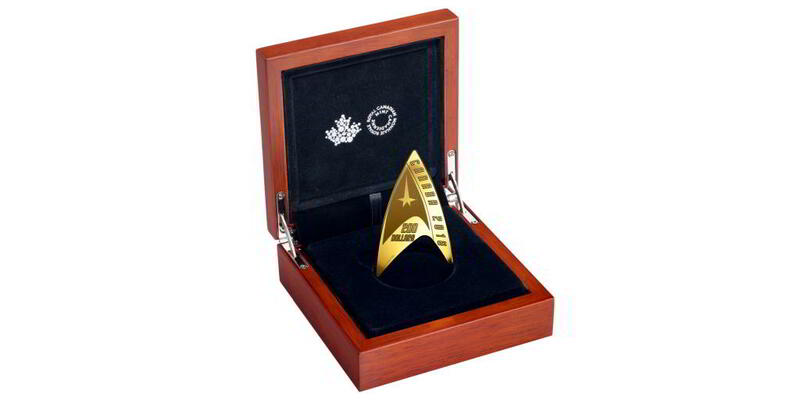 Enterprise, Captain James Tiberius Kirk, was unveiled by William Shatner, the Canadian-born actor who made this character a household name, and Mint President and CEO Sandra Hanington at an event hosted by the Canada Aviation and Space Museum. If you’re hoping to get your hands on the gold Delta Coin pictured above, you’re too late. All 1500 coins have been sold. Maybe you can find one on eBay. There are a number of other options available with prices starting around $20. What do you think? Will you be ordering any?